The writer Augusten Burroughs is back with another of his childhood memoirs of his strange family. We might remember him as the young boy with a box on his head from Running With Scissors, but in A Wolf At The Table: A Memoir Of My Father, he’s got a darker (though in the other way, considering his box didn’t even have eyeholes so he had to rely on the seams and peeking out of the bottom of the book to provide enough light to see what little he could) tale. 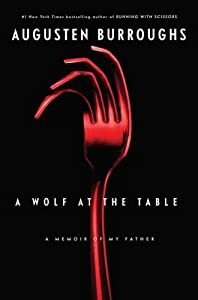 A Wolf at the Table is a story of varying dinners he had with his father — who’d be estranged if he didn’t keep coming back. The dinners are all uniformly unpleasant, but in differing ways. There’s one where the main course is Burroughs’ beloved Elk Hound “Wolf”, served with a glazed apple between his jaws. Perhaps the most upsetting thing of this dinner was that the dog wasn’t skinned, and so Burroughs and father had to eat through the fur. Luckily, this didn’t get in the way of the flavor of the meat. Unfortunately, the dog was so big, much was wasted, as his father steadfastly disagreed with the concept of leftovers, believing them to betray a lower status, as if they could not afford to have a new, fresh meal every night. The centerpiece of the novel, though, is the one where before dinner was served (a more traditional meal of cornish game hens with potatoes au gratin as a side dish and a nice port), Burroughs’ father lit everything in the dining room on fire — which, of course, began to spread to the rest of the house. Intent on making his son uncomfortable, the rule was set that no one could leave the table until the meal was finished. So, you have both Burroughs and his father, attempting to eat a meal with utensils bending and distorting from the heat, trying themselves to not die of aspyhixiation, smoke inhalation or even, ironically, cooking to death. Reading A Wolf at the Table, one wonders how close of a memoir it is. Living with a box on one’s head for a few years is somewhat believable, but for Burroughs’ sake, the reader hopes that he’s making these episodes up. If Burroughs even survived, he’d be a deeply damaged person mentally if not also physically. Hopefully, though, a James Frey problem isn’t in his future; if he did indeed live through this, it’d just be an insult. And, even if he didn’t, one wonders at the type of person who could create these terrors of whole cloth.